Every once in a while, you arrive at a place, drop your bags at your accommodation, take a couple of minutes to walk around and instantly feel comfortable and at home there. It’s a magical feeling that I can only compare to that of falling in love at first sight. In my travels so far, the only place that has managed to make me feel this way is Pemuteran – a sleepy, fishing village in north-west Bali. Getting to Pemuteran took around 3-4 hours by car from the very busy Legian at the south of Bali. The journey itself will reward you with views from the mountainous area of Central Bali and sights of lush rice fields on your left and right. As you turn left somewhere near Lovina and arrive at Pemuteran area, the Balinese Strait will show up on your right with a huge hill towering on your left. Though the roads are huge and logistics trucks carrying anything from rice to cement from Java drive through them as well, kicking up some dust in the process, it’s definitely not the worst of roads with the beauty surrounding it. The views were gradually blocked by small eateries and shops, behind which were most of the village’s accommodations, dive shops, and coastline. At 5 PM – 1.5 hours near sunset time, after a bit of trouble with navigation, my family and I turned right into a smaller road and arrived at Biorock Homestay, Pemuteran. We dropped our luggage and had a bit of a chat with Bli Komang – the manager who passionately showed us photos he recently took under the sea from the beach behind the homestay and spoke about reef conservation as well as how we can be a part of it. 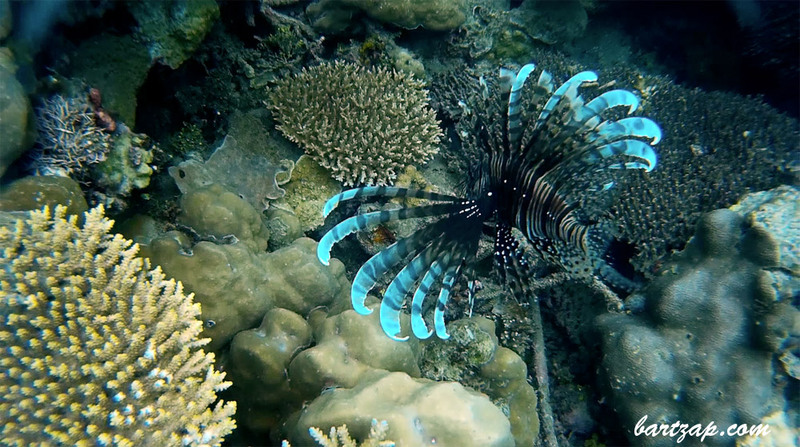 Turns out, he’s a technical director at Biorock Indonesia – a breakthrough reef conservation project in the country. After a very enlightening talk about the reefs in Pemuteran, it was time to head to the beach. And it was love at first sight from there. About 50 meters from our homestay was apparently the location of absolute paradise. The black, volcanic sand was soft and blessedly free of trash. The only nuisance were pieces of coral reefs and seaweeds washed up on the shore, but otherwise, it was probably the cleanest beach I’ve ever set foot on. The water was cool and washed up on the shore in small waves. I walked into it, looked down and found that it was so clear that I could see what was going on underwater. The skyline was beautiful with clouds adding texture to the sky which was slowly turning orange, a floating house in the distance and fishermen’s boats. The most amazing thing was how calm and quiet it was. There weren’t too many tourists except for some vacationing couples lounging by the sea or swimming in it. Most of the excitement came from the local villagers who were playing in their actual backyard beach, burying themselves in sand, chasing each other, and diving into the sea. For someone like me who loathes conceited tourist crowds with their snobbishness and ignorance, this was absolutely perfect. After sunset, we trudged back towards the main road to buy dinner. Along the way, we walked past another homestay with three friendly puppies there absolutely loving our presence. Naturally, this led to a chat with the puppy owners who said that their puppies just love people. We bade a “see you” to the puppies and their smiling owners and walked to Warung Setia – a roadside eatery with board and card games and a waiter who was playing guitar when we arrived. They had some options of Italian and Indonesian food and I decided on their Prawn Fried Rice because what could be better than fresh shrimps from the ocean across the road? That night, after having our take-out dinner in the homestay and shooing bugs from the outdoor bathroom, I got out to experience the night breeze, tilted my head up and what I saw made my jaw drop. The clouds had cleared up and a glimpse of heaven could just be seen above in the form of stars. A massive expanse of glittering white stars everywhere I looked. I was awfully inexperienced with astro-photography and had no tripod with me at the time so I sat down on the grass, laid my camera down facing up on some flat land and took photos. The breeze from the ocean was strong that night but I didn’t mind. I wanted to capture what I saw as best as I could. There were stars everywhere I looked and I couldn’t stop being amazed – living in a city so polluted with light that I rarely see this in my daily life. It was a nice way to end my first night in Pemuteran – star-gazing on the homestay’s garden. The next day was mostly spent in an excursion to nearby Singaraja for some history and cultural travel (post coming soon!) But when we returned to the homestay at 4.30 PM, went to the beach and Bli Komang – who was there with his kids – asked me if I wanted a lesson in snorkeling in Pemuteran’s pristine waters, I impulsively said yes. My “yes” was actually considerably bold given my last experience in the ocean included not being able to breathe properly 7 meters underwater. But it was too late to back out of it as I was already in my swimsuit walking towards the sea when the thought occurred to me. That “yes” actually turned out to be the right decision because 10 minutes into the snorkeling lesson, the ocean became my new best friend. Bli Komang turned out to be a dive instructor which made him more than qualified to teach me about surviving while snorkeling in the ocean. The lesson was divided into three parts: breathing with a mask, floating, and learning to optimize the fins. All of these came with two big keys: staying calm and trusting that nature will do its part to keep you alive if you do. The most important lesson for me though, was how much of a mental thing it is. Once you control your mind to stop freaking out about how far the bottom of the ocean floor is and just focus on being in the moment and breathing right, it gets so much easier. Also, when you’ve got a 6-year-old and a 3-year-old snorkeling like they were born to do it ahead of your competitive self, it will give you motivation to keep up with the lessons. It also helped that what was under the sea was a sight to behold. Right there, just a couple of meters from shore was a spectacular display of marine biodiversity. Unfortunately, I left my GoPro that day and didn’t capture any footage, but here are some pictures of what I saw underwater captured by other divers. The sea I was exploring is actually the site of Pemuteran’s Biorock project. Biorock itself is a method of restoring and conserving damaged corals by building reef structures upon which baby corals are planted and electrified to accelerate growth by up to 6 times. 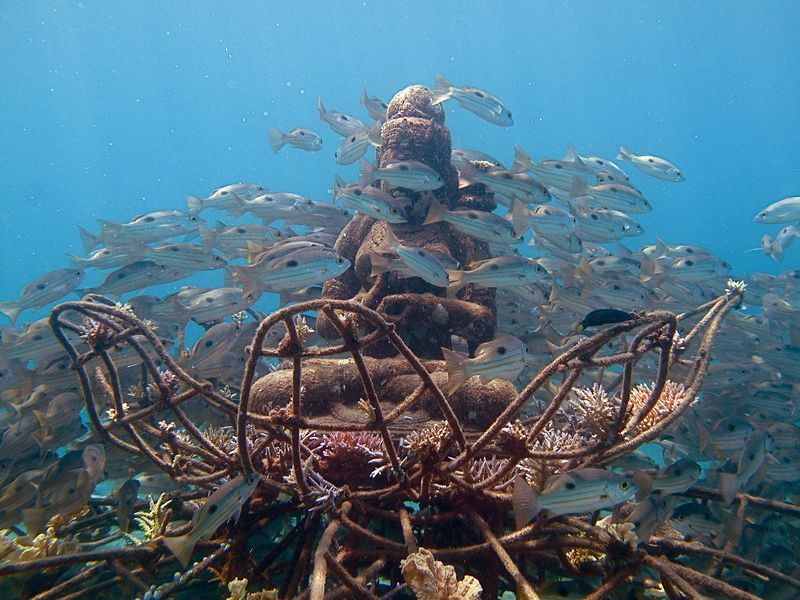 The presence of this project along with the eco-tourism awareness campaign that came with it worked wonders to restore Pemuteran’s reef ecosystem and ensure its sustainability in the long run. Also, it made the sea so incredibly colorful and magnificent. The water was cool and clear that afternoon and there were no currents. It felt like a swim in the pool actually – except there were so many fishes around. It was amazing to see the structures of Biorock which were creatively shaped to look like goddesses, lotus flowers, domes, bicycles and more in front of me with coral reefs all over it. It was even more incredible to be surrounded by so much marine wildlife I’ve only seen in documentaries. That day, I saw anemones and clownfish in it, a lion fish, plenty of angel fishes and parrot fishes, schools of banner fish and even a child barracuda. I saw blue and red starfish buried under the sand and many other fishes I can’t recognize and it was truly an experience which made me fall in love all at once with the ocean. Suddenly, I feel the anger at the ignorance a lot of tourists use while swimming in the ocean, sacrificing sustainability for the sake of photo ops and how it has resulted in the ruin of marine life. Suddenly, I have the urge to protect this as best as I can. Though Bli Komang and I had to return to shore a couple of times because it was jellyfish season and they stung and made my entire limbs itching, I just wanted to come back out into the water again to see more. It was an addictive sensation, floating and watching the life of fishes underwater happen all around you. I finally decided it was time to stop for the day around sunset. As I took off my fins and dried off with a towel, I turned to face the ocean and saw a rainbow in the distance. And that was how I watched the sunset that day: on the beach, letting the waves wash up to my legs, teeth a bit chattering from the wind, salt in my hair, and a rainbow in the distance. It was Christmas Eve that night so after that insanely awesome afternoon, we decided to buy dinner and fireworks for the entire homestay staff, ordering delivery from a nearby restaurant. Funnily enough, the Russian couple living in another villa in that homestay had also bought pizza and drinks for the entire staff. And so, we converted the homestay’s garden with a makeshift Christmas tree topped by a plastic chicken into our party venue and that was our Christmas Eve: sharing dinner and lighting up fireworks with strangers who became our new friends. It was a night of great banter with interns at the homestay who turned out to be around my age – Sandi and Thomy, pranks with full-time employee – Eko, chats with Bli Komang and the Russian couple who turned out to be scientists – Maxim and Olga, and a night of music courtesy of Bli Komang’s daughters. We had fireworks and homemade singing and drumming and so much food that night. Though the hotel next door had a big fancy party with booming speakers blasting music, I’d say we had the more exciting party. When the next day arrived, I wanted to snorkel one last time before leaving Pemuteran. Though Bli Komang couldn’t go to sea with me, I ended up going with Eko who was only 18 years old but already has about 4 years of diving experience from helping out at Biorock. Our snorkel at 8.30 AM on Christmas Day was much better than that of the previous afternoon. There were much less jellyfish in the sea that day and although the fishes were less diverse, there were more starfish in the ocean that day. I was also much calmer this time around and even went off swimming on my own a couple of times. Eventually, Eko guided me to a buoy a bit further away from shore with deep enough water that we could be upright and there, I took off my snorkel, cleaned it out while chatting with him about his life. Yeah, you read that right. This woman who had been scared to enter the sea just a day before was now floating around in the middle of the sea cleaning out her mask while talking. We returned together to shore after checking in with Sandi who was diving to examine the Biorocks and then it was time to pack up and say goodbye. Bli Komang checked in on me, asking how I progressed that day in my snorkeling journey and I was incredibly pleased to report how calm and collected I was that morning. He seemed really thrilled that I was making strides in exploring the sea and reckoned that next time, I could begin moving on to scuba diving so I can truly be immersed into the ocean. He also invited our family to come back to Pemuteran again and experience staying in the village again. And after experiencing the kindness of its community, the fierce commitment they have to protect the ocean, the wondrous marine biodiversity, and the overall quiet and calm the village had, I liked the sound of that. Until this date, I still miss Pemuteran so dearly and cannot wait to return for a much longer stay. For information on how to get to Pemuteran and what to do there and more, check out my guide for Pemuteran here! For information on how you can contribute to Biorock Indonesia’s project, check their website! For information on how you can contribute in protecting coral reefs and marine biodiversity, read this awesome article.